Venice Biennale Professional Development Program – Emerging Arts Professionals. L-R, top to bottom: April Philips, Blake Griffiths, Gina Mobayed, Imogen Dixon-Smith. An impressive team of emerging arts professionals, exhibition team leaders and volunteers will support Australia’s exhibition in Venice, as part of the Australia Council’s Venice Biennale Professional Development Program. 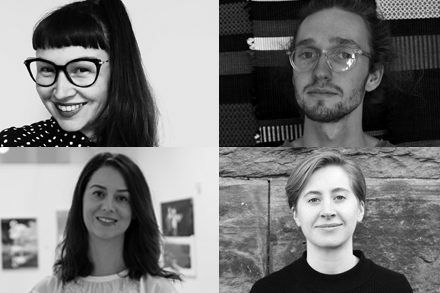 The Australia Council has announced the program’s participants – four of whom were supported through Create NSW’s Emerging Arts Professional Program – who will gain valuable firsthand experience and networks while working behind the scenes on one of the biggest events in the international visual arts calendar. For the first time, the program has expanded from an opportunity for curators only to include those working across all areas of the arts including education, arts journalism, arts administration, exhibition design and development. Australia Council Executive Director Strategic Development and Advocacy Dr Wendy Were said the Professional Development programs were a key part of the Venice project that includes Australia’s national participation at the Biennale, supported by a significant donor program. “The program is a proven launch pad for arts professionals. Many past participants now hold high-level positions within the Australian and international arts sectors and credit their time in the program as a pivotal point in their career development. This really is a great example of how Australia’s representation at Biennale Arte 2019 can be leveraged to create opportunities and build the capacity of the broader visual arts sector,” she said. April is a Wiradjuri-Scottish illustrator, visual arts educator, and researcher based on the south coast of NSW – Yuin country. Working as an independent practitioner and audience specialist, she travels far and wide to work with young people in collaboration with art institutions and organisations. April experiments with new modes of visual storytelling and character design to deliver key messages in conjunction with school-based education systems. Central to her current process is the integration of virtual excursions as a way of connecting geographical locations. Virtual technologies are implemented as a mode of delivery, to ensure access for audiences living outside of city centres. Blake is an Arts Educator based in the far west of NSW. Blake initiated collaborative project, FRESHbark; a mentorship program working with emerging Indigenous Artists in the area. Blake’s passion encourages, promotes and fosters art-making experiences as a holistic approach to wellbeing in regional areas. Working across education, curatorial and artmaking, his role at BHRAG connects with audiences of different cultural and economic backgrounds and leads them into an expanded and deeper sense of their own intelligence and capacity. Gina is the director of Goulburn Regional Art Gallery, delivering an arts program across exhibitions, commissions and learning initiatives as well as building and diversifying its permanent collection. She has worked in the visual arts sector since 2010 and has delivered hundreds of exhibitions and initiatives across art forms in Australia and abroad. Prior, Gina worked at the federal government initiative, Artbank and was a Codirector on the 2015 – 2016 board at Firstdraft. She has also worked at the Museum of Contemporary Art, Australia and Grantpirrie Gallery, Sydney. Gina’s most recent curatorial project, Deep Revolt, a mid-career survey of Arlo Mountford’s work will commence a national tour from April 2019. Imogen is a Sydney based curator with experience working across a number of curatorial and collection management projects. She has a keen interest in modern and contemporary art, holding a Masters of Museum and Heritage Studies and an undergraduate degree in Art History. Currently, Imogen is Assistant Curator at Artbank, working collaboratively across the Curatorial and Registration teams in the display, administration and management of the Artbank collection. Prior to this, Imogen worked with Museums & Galleries NSW as Gallery Programs and Touring Exhibitions Coordinator, taking exhibitions of contemporary Australian art to regional galleries across the country. Bree is a curator and writer with a particular interest in interdisciplinary projects spanning performance, dance and the visual arts. In 2017 she organised Philipp Gehmacher: my shapes, your words, their grey at Griffith University Art Museum, and undertook a French Ministry of Culture placement with Centre Pompidou, Paris, contributing to Move, a month-long festival of performance, dance and film. Bree was Curatorial Fellow for the 20th Biennale of Sydney, working on performance across the exhibition, and prior to that was Associate Curator, Contemporary Australian Art, at the Queensland Art Gallery | Gallery of Modern Art, curating projects such as Trace (2014), Everyday Magic (2013), and Embodied Acts (2012). Kate is an artist and curator working at the intersection of art, education and community. Kate has held positions and organised projects in a range of environments, such as festivals, institutions, artist-run initiatives, community spaces and schools; both in Australia and abroad. This includes the National Gallery of Victoria, the Biennale of Sydney, Centrum and Moreland City Council. As an independent practitioner, in 2018 Kate undertook a research residency at the Kuandu Museum of Fine Arts, founded Pavement Projects and participated in the 4A Curators’ Intensive, the Shanghai Curators Lab and MoreArt Public Art Show. Amanda is an emerging curator from Sydney, interested in young and emerging artists working across disciplines. Amanda was recently awarded a Master of Curating & Cultural Leadership ‘with Excellence‘ from The University of New South Wales and has broad ranging experience in exhibition development and production. She has interned with The Curators’ Department (Sydney), and has worked and volunteered for key Australian arts organisations including Carriageworks, Sydney Biennale, Kaldor Public Art Projects, MCA (C3West), and Art Month Sydney. Amanda also holds a Bachelor of Fine Arts and a Master of Design from UNSW, spending time studying in Milan (IT) and Otago (NZ). Courtney is a Sydney based practicing Artist and Curator. Having graduated from a Master of Art Curating at the (USYD), and a Bachelor of Visual Arts and Design (ACU), Wagner is currently curator of the Adelaide Perry Drawing Prize and Gallery at PLC (Presbyterian Ladies College) Sydney. Wagner also works at the Art Gallery of NSW in Visitor Experience as a Team Leader and Learning and Participation as an Artist Educator. Wagner’s artistic practice of enquiry into identity is pertinent to her exploration of self, while her curatorial practice and interests lie in the notions of memory, history and forgetting, within Australian contemporary art. Eva is an emerging writer, curator and arts worker from Sydney. In 2018 she completed a degree in Art History and Curating at Monash University, Melbourne, which prompted her to develop her writing practice and experimental curatorial methodology. Eva explores the idea that linguistic resources govern how individuals experience and move through gallery spaces and aims to counter, expose and change this effect. Eva has been working at the Monash University Museum of Art whilst volunteering for many exhibitions, including the 21st Biennale of Sydney. She also collaborated for ACCA’s Writing in the Expanded Field program in late 2018. Hannah is a Sydney-based arts facilitator and artist working in sculpture and installation. Drawing inspiration from the Australian landscape, her practice engages in a process of collection and re-assemblage in an attempt to re-image our place in the natural world in this anthropocenic age. Through both artistic and professional practices, Hannah has worked with arts organisations to help deliver engaging, immersive artistic experiences for over five years. The Emerging Arts Professionals program is delivered in partnership with Create NSW; Arts South Australia; Creative Victoria; Culture and the Arts (WA), Department of Local Government, Sport and Cultural Industries, Arts NT, Department of Tourism and Culture, Arts Tasmania and Arts Queensland.